View of South Glencraig from Pit Bing - c1930. Note the tram driving up the main street and the two storey tenement houses in the background. This is one of the remaining photographs showing these tenements. Contle Rows c.1905. Dr Dixon's can be seen parked outside the chemist. The Lochgelly Co-operative building is in the middle right of the photograph. This photograph was taken near the Lochgelly Co-operative building looking south towards Lochgelly and was probably taken in the early 1920s. Miners children heading off for a days fun at the miners gala day. By the look of this march, however, they were on their way to the King George V playing field at nearby Crosshill rather than the Glencraig F.C. ground. Prior to the purchase of “The Estate of Glencraig” by John Wilson, of Airdrie from George Constable in 1894, Glencraig was a small insignificant place consisting of four farms, the Mansion House and the stone built Contle Row. These houses consisted of the Village of Contle, whose name goes back to 1546, when the lands of that name were part of the estate called Cluniecraig. John Wilson, in 1894, sunk test bores on his acquired land and justified his endeavour when he struck the rich coal seams of the Benarty Basin. The following year The Wilson and Clyde Coal Company commenced sinking two shafts and established the Glencraig Colliery. Things then moved very rapidly, with North and South Glencraig being built for the colliery workers. It seems strange that the terms North and South were used to describe and perhaps separate Glencraig. This is because the estate of Glencraig at that time was in two separate parishes, namely the Parish of Ballingry to the north of the Fifty Burn and the Parish of Auchterderran to the South of the Fitty. The burn marked the boundary between the parishes. By the turn of the twentieth century, the colliery was in production, and the population of Glencraig stood at 1,000 souls. This rapid growth continued until at the start of World War 1 when the population had grown to nearly 3,000. Those were the days when the colliery was at its peak with manpower reaching 1,100 underground and over 200 employed on the surface. The prosperity and prospects of the village are thus inevitably linked to the success of the colliery. 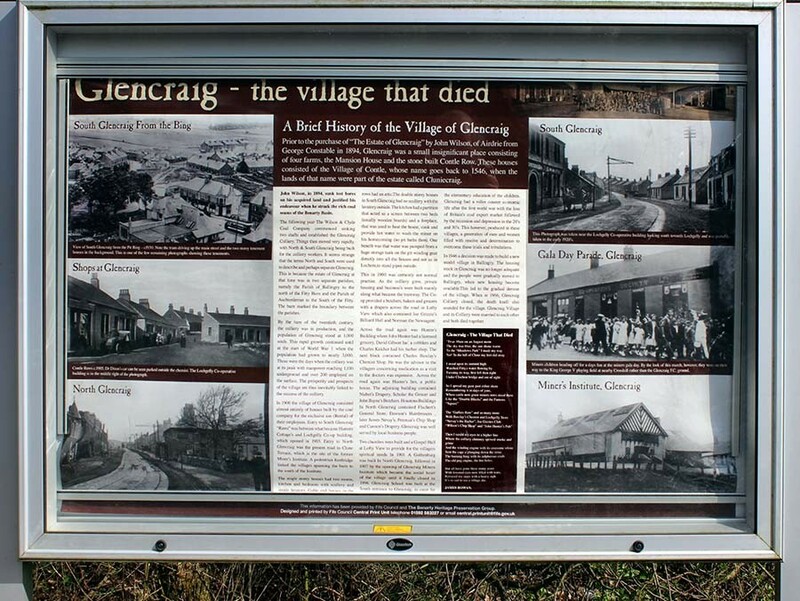 In 1900 the village of Glencraig consisted almost entirely of houses built by the coal company for the exclusive use (Rental) of their employees. Entry to South Glencraig “Raws” was between what became Hunters Cottage’s and Lochgelly Co-op building, which opened in 1903. Entry to North Glencraig was the present road to Clune Terrace, which is the site of the former Miner's Institute. A pedestrian footbridge linked the villages spanning the burn to the south of the Institute. The single storey houses had two rooms, kitchen and bedroom with scullery and inside lavatory. Gable end houses in the rows had an attic. The double storey houses in South Glencraig had no scullery with the lavatory outside. The kitchen had a partition that acted as a screen between two beds (usually wooden boards) and a fire place, that was used to heat the house, cook and provide hot water to wash the miner on his homecoming (no pit baths then). One benefit was that water was pumped from a huge storage tank on the pit winding gear directly into all the houses and not as in Lochore, to stand pipes outside. This in 1900 was certainly not normal practise. As the colliery grew, private housing and business's were built mainly along what became the tramway. The Co­-op provided a butchers, bakers and grocers with a drapers across the road in Lofty View which also contained Joe Grizzie’s Billiard Hall and Norman the Newsagent. Across the road again was Hunter’s Building where John Hunter had a licensed grocery, David Gibson had a cobblers and Charles Keicher had his barber shop. The next block contained Charles Barclay's Chemist Shop. He was the advisor to the villagers concerning medication as a visit to the doctors was expensive. Across the road again was Hunter’s Inn, a public house. The adjoining building contained Nisbet’s Drapery, Scholar the Grocer and John Bayne's Butchers. Houstons Buildings In North Glencraig contained Flachert’s General Store, Dawson's Hairdressers , later James Nevay’s, Penman’s Chip Shop and Cannon's Drapery. Glencraig was well served by local business people. Two churches were built and a Gospel Hall at Lofty View to provide for the villagers spiritual needs. In 1901 A Gothenburg was built in North Glencraig, followed in 1907 by the opening of Glencraig Miners Institute which became the social heart of the village until it finally closed in 1996. Glencraig School was built at the South entrance to Glencraig, to cater for the elementary education of the children. Glencraig had a roller coaster economic life after the first world war with the loss of Britain’s coal export market followed by the recession and depression in the 20's and 30's. This however, produced in these villages, a generation of men and women filled with resolve and determination to overcome these trials and tribulations. In 1946 a decision was made to build a new model village in Ballingry. The housing stock in Glencraig was no longer adequate and the people were gradually moved to Ballingry, when new housing became available. This led to the gradual demise of the village. When in 1966, Glencraig Colliery dosed, the death knell also sounded for the village. 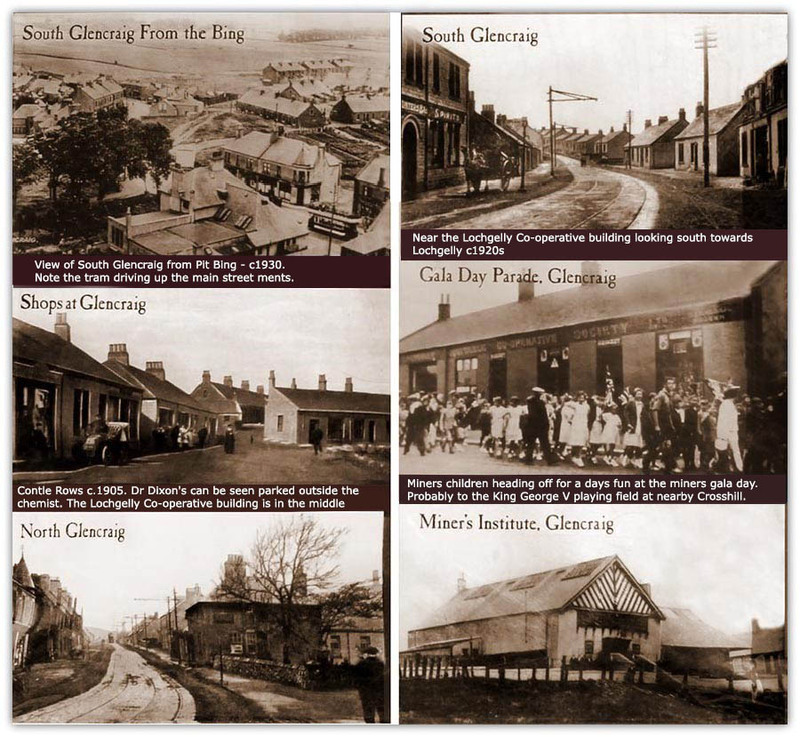 Glencraig Village and its Colliery were married to each other and both died together. Under Clochrat bridge and out of sight. Remembering it in days of yore. Like the "Double Blocks" and the Famous "Square"
"Wilson's Chip Shop” and "John Hunter's Pub"
Sent the cage a'plunging down the mine. The old pug engine, the fire holes. With lowered eyes now filled with tears. It’s so sad to see a village die.